Height-Adjustable Desks (aka Site/Stand Desks) – 2014 Update. In November 2012 – two years ago – I wrote an article on height adjustable desks. It consisted of my research on the subject – what options were available, useful articles on the topic, etc. For the last two years I have used a standing desk – essentially a drafting table – for work. It is adjustable, but it requires loosening bolts and is fairly involved – so I rarely change its height. I’m still looking at height adjustable tables (of the crank or electric variety) and decided to update my original article. I know from personal experience and from reading various articles (cited in the bibliography at the end of this page) that standing all the time isn’t an option for most people (including myself). A standing desk may be better for my health, but it certainly doesn’t feel better for my knees. If you are aware of additional adjustable height desks I have not included in this article, please let me know. I’m also always interested in reading any articles of real substance on the subject. One site you’ll definitely want to visit during your purchasing process is Comfortable Computing. Be sure to check out their interactive tool “Workspace Planner” – it will help you decide what height you need your adjustable desk to be able to rise to. You might also want to visit JustStand which has a nifty calculator for determining how many calories per day you would burn from standing rather than sitting. Features: hand crank, 27.5″ to 47″ height adjustment, 30 day return guarantee, 1 year warranty against defects, 5 years on steel. ModTable – $599 – Available in various sizes, uses crank. Mini Mod – $599 – A smaller version of the ModTable, but since pricing is the same, not sure why you would ever buy one…unless you had a very small workspace. Mod-E – $649 – An electric model instead of hand crank. Features: electric lift mechanism, 26.5″ to 42.5″, 1.25″ high pressure laminate desktop, 300 lb. weight capacity, each leg has own motor, 20 min. setup, 5 yr. warranty. Features: manual lift mechanism, 26.5″ to 42.5″, 1.25″ high pressure laminate desktop, 225 lb. weight capacity, 5 turns per inch (precision), 20 min. setup, 5 yr. warranty. Also offers the SquaredUp line of desks (corner), UpWrite (surface can be written on with dry erase markers). Offers a number of nice accessories as well. S&H is $129 on electric, $99 on crank. Features: 335 lb. weight capacity, 4 programmable presets, each leg has own motor, 1.1″/sec. lift speed, 23″ to 48.75″, 2 yr (motor) / 5 yr (frame) warranty. Features:28-35mm/sec. lift speed, 275 lb. weight capacity, 23″ to 48.75″, 2 yr (motor) / 5 yr (frame) warranty, each leg has own motor. These guys are expensive. I think they are going for the “Apple” of height adjustable tables. Features: 30 Day Satisfaction Guarantee, 3 Year Warranty (depends on model, some come with 2 Year and the Fit with a limited lifetime). Offers a number of other options including the Terra Pro, Air Pro, L Series (l-shaped desks), U Series (u shaped desks), solo (and plus), Up, Fit (w/treadmill), custom, and conference. Suggests Bill Me Later, which allows for financing, brings costs down to around $50/mo. for the Terra. Features: 22″-48″, 275 lb. weight capacity, 1.1″/sec. lift speed. Two-Leg Short Base – $1450. One-Leg Electric Base – $988+. Three-Leg Electric Frame – $2890. A number of options, prices appear to have increased significantly since last time I updated this article, but so has the variety of options available. Features: Lifetime warranty (on material defects), 30 day full refund return period, free shipping. Deluxe Height Adjustable Computer Table – $359 – Height begins at 24″, a number of variations available. Appears to be a little difficult to adjust – not crank or electronic. Edison Electric Table – $1199 – Electric height adjustment, up to 50″ tall, available in 36″, 48″, 60″, and 72″ widths. Split Level Adjustable Computer Table – $499 – Available in various sizes, uses grommets for adjusting height. Versa Center – $300 – Available in various sizes, doesn’t appear to use crank or electronic adjustment for height. Adjustable Wall Mount Computer Station – $280 – This looks very interesting, but it concerns me that it appears to support only one monitor. Deluxe Electric Life Wall Mount Computer – $700 – The name is a bit of a misnomer – it is a station, not the computer itself. Again, appears to only support one monitor. Prices have increased significantly on a number of models (Edison from $899 to the present $1199). Not all prices have been updated (here); their hand adjustable crank model has been discontinued. Offers a number of models, many are standing desks of fixed height. I like lots of leg room and these don’t have it, but some might like them – they have extra shelving. Muv 28″ Adjustable Height Workstation – $448 – 29″ – 34″ height. Muv 35″ Adjustable Height Workstation – $479 – 29″ – 34″ height. Muv Stand-up Adjustable Height Workstation – $505 – 35″ – 49″ height. Starts around $1400 for a complete table, though you can also purchase just the bases for around $700. Has a decent variety of options including some wall-mount options. Site could use some improvement in navigability. This used to be listed under Idea at Work and linked to The Human Solution. I’ve updated to point directly to the Workrite site and have eliminated the previous entry due to Workrite discontinuing the Proliftix line. Elevate II – 28″ – 47″, electric, $1300. Elevate Adjusta – 27″ – 53″, electric, $2850. Elevate Corner – 27″ – 53″, electric, $4930. Elevate Wrap – 27″ – 53″, electric, $3100. Elevate Single – 27″ – 53″, electric, $2380. Fit Adjusta – Pricing starts at $829, only goes up to 31.25″. Fit Console – Pricing starts at $1179, only goes up to 31.25″. They’s also added a new line “Steve’s Station” with prices starting at $3249. Features: has an expandable frame (can become wider as needed), can have a programmable controller (save height settings), electronic up/down. Starts at $599 with a number of accessories available to customize the unit. Offers units which fit on top of one’s existing desk. The Single (supports one monitor) starts at $275, at the higher end is the Pro Plus at $350 which supports dual monitors and has a keyboard lift. Hand crank models for $599. ThermoDesk Elemental – $549 – hand crank. ThermoDesk Ellure – $619 – hand crank. ThermoDesk Electra – $829 – electronic. Features: 28″ to 45″ adjustable height; supports up to 225 lbs; top size is between 23.5″-40″ width and 49.5″-70″ length; choose between standard and deluxe memory control. They have one base model, which costs $399 for the frame. Then one adds the top, laminate 30″x60″x1″ runs $110 while bamboo runs $180 for the same size, thus price for minimum configuration including top is $509. This is an apples-to-oranges comparison table, it demonstrates price ranges of the products and min/max heights, but doesn’t account for most other features. AFC Industries Inc. – Offers what looks like professional office furniture that is height adjustable. Alvin Professional Table – Looks to be a drafting table, available via Walmart, it ranges from 29″ – 45″. May be a bit of a pain to adjust, but the price starts at $199. Biomorph – Sells several different models beginning at $995. Cotytech – Sells several adjustable height desks, including a laptop desk that can go up to 41.9″ and costs $264. Dania Furniture – Offers a desk for $1100, adjusts up to 52″. ergodepot – $695 is the current sale price, offers free S&H. ErgoTron – Offers desk mounts, full desks, and mobile carts. The full desks start at $737. Gilbraltar – Sells bases for adjustable height desks. Pricing appears reasonable ($400+/-) but only go up to 39.5″. Can be purchased through Kitchensource. Haworth – Available through Crate and Barrel for $299. Very inexpensive, but see reviews on Crate and Barrel site for downsides. Also sells an electric table for $1390 available from Sit4Less. Humanscale – Starts at around $1800 for their “Float” desk. idealworkspace – Based out of Singapore. ISE Group – Sells several different height adjustable tables, both crank and electric, but one has to order through VARs, thus no pricing. Jesper Office – Their “value” desk starts at $1450. Maverick – Sells through VARs. Mayline – Starts at $3000 for most height adjustable desks. The Soho Adjustable Mobile Computer Table is available from Walmart for $350 and goes from 14″ – 48″. Pressfit Furniture – These are fixed height, cost around $399. Right Angle Products – A variety of options, not clear on pricing. Relax the Back – Offers the Sit to Stand Desk starting at $1600+. Reo-Smart – Makes several height adjustable workstations, unfortunately they only go up to 37.8″ but the prices start around $570. RightAngle – Has height adjustable desks, but fairly expensive. SiS – Sells several adjustable height desks, unfortunately they are pretty expensive ($1500+). Soma Ergonomics – Start at $1000+ and go up from there. Steelcase – Sells the Airtouch, which is priced around $1500. UpLift – Available via The Human Solution. Numerous different models available, the Uplift 445 starting at $749. Beyond the Office Door – Seels the VertDesk, base is $549, once a top is added the price jumps to $689. Desktop Elevator – Fits onto existing desk, starts at $829. Health Postures – Offers units that are placed on top of existing desk. iSkelter – Upgrades for existing desks to become standing desks. StorkStand – Mounts onto chair, single monitor, $199. Upstanding – Mounts on a normal desk, is height adjustable, costs $200 for standard (one monitor) or $250 for double-wide (two monitor). Is electric better than crank? In my opinion, it may be better to get a crank unit (which is cheaper) as mechanical parts tend to last longer than electronic components. I wouldn’t be surprised to see a dead electronic table five years down the road, but I’d hope the manufacturing quality would allow a crank table to be usable twenty years later. How high and how low does my desk need to go? Comfortable Computing has a great calculator that uses your height to determine how high your desk should be when sitting and when standing. ModTable – There are cheaper options available, but this appears to be the lowest priced high-end height adjustable desk I could find. I’m interested in their $549 crank unit. The one downside I see to these units is their minimum height of 27.5″. According to Comfortable Computing when sitting I should be using a keyboard at 25″ – so in sitting, I won’t be ergonomically correct. I could fix this by affixing a keyboard try underneath the desk which would probably bring the level down 1-2″. UpDesk – Another attractive option which offers a lower minimum height (26.5″, but still too high for me) and on the negative a lower maximum height (42.5″, which is enough for me). The unit is around $100 more expensive than the ModTable. GeekDesk – I must admit a certain attraction to GeekDesk due to their popularity and their cool name…but the product is also solid. The cost is around $800, but the unit is electrically powered and it goes as low as 23 in. and as high as 49 in. – that seems about perfect to me for height minimum and maximum. On the downside, expect to pay $125 for S&H! At this juncture I’m divided. I’d really like a hand-crank table (more reliability) but also think the min. and max. heights on the GeekDesk are the best. I’m leaning slightly towards ModTable b/c of the lower price and the hand-crank, but I’m still up in the air. What do you think? Are there other options I should be consulting? Other factors I should be considering? I’ve transitioned into the full-time pastorate and stand at my desk as often as possible (I have a no-name drafting table right now) and sometimes my feet hurt from doing so. Here are a few articles I found that address this issue that others may find helpful as well. Dr. Steve Rosenberg. When Your Feet Hurt, Everything Hurts. Ouch! Huffington Post, 4/15/09. Rona Aquino. How to Keep Your Feet From Hurting After Standing. eHow. Apparently there are “anti-fatigue” mats specifically to relieve this issue. I’ve purchased a Genuine Joe Anti-Fatigue Mat 2’x3′ for around $20, it seems to help but doesn’t remove the issue. A good Q&A is over at paleohacks on the leg issues caused by standing for extended periods of time. Another helpful Q&A can be found on Quora. Reddit has a subreddit dedicated to Standing Desks. Those interested in building their own desk may want to check out OpenDesk. Quora has a topic dedicated to Standing Desks. For standing I currently use a height adjustable drafting table I picked up at a garage sale. It goes up to approximately 39″ in height (3.25′). It is 36″ wide (3′) and 24″ (2′) deep. It allows for adjusting the angle of the desk up or down, something most height adjustable desks do not. On my standing desks I have two Fellows monitor mounts which add another 4″ to the height. For sitting I currently use a small desk, it is approximately 29″ tall (2.4′). It is 45″ wide (3.75′) and 20″ deep (1.7′). I’m apparently shrinking, I’m pretty sure I was once 5’8″, but remeasuring, I’m clocking in at 5’6″. According to Computing Comfort’s calculations I should have my standing keyboard at a height of 40.5″ and the top of my screens at a height of 61.5″ – in other words, my keyboard is 1.5″ too low and my monitors are 2.5″ too low (after calculating in the height of my monitors at 17″). According to Computing Comfort’s calculations I should have my sitting keyboard at a height of 25″ and the screens at a height of 46″ – in other words, my keyboard is 4″ too high and the monitors are exactly right. Below I’ve compared my three finalists – the first two are crank, the third electric. Only the third goes low enough for me, but I can mount a keyboard under the first two to correct this issue. The prices below include S&H. UpDesk CrankUp Small 26.5″ 42.5″ 48″ 30″ $798 5 yr. The number in parentheses includes the longer warranty which covers only part of the desk (e.g. in GeekDesk, it does not cover the motor past two years). It looks like a 3M Knob Adjustable Keyboard Tray would be ideal, it has high reviews on Amazon and clocks in at around $100. “A Week with a Sit-Stand Desk.” Pandawhale. 1/28/12. “Build an Adjustable Desk with Pipe and Klee Klamp.” Simplified Building Concepts. “GeekDesk Max Review.” Gear Live. 8/31/12. “How Can I Build a Wall Mounted Adjustable Height Desk?” DIY.StackExchange. “How Do I Make a Height Adjustable Desk?” DIY.StackExchange. “How Do I Make My Own Height Adjustable Desk?” Lifehacker. 1/26/12. “How to Build an Adjustable Height Computer Desk for Under $100.” Tutorial Save. 11/21/10. “Refold Cardboard Standing Desk Changes the Way You Work.” designboom. 10/7/14. “Standing Desk.” Lowes Creative Ideas for Home and Garden. Aaron Couch. “10 Accessories Every Standing Desk Owner Should Have.” MakeUseOf. 12/30/13. Adam Dachis. 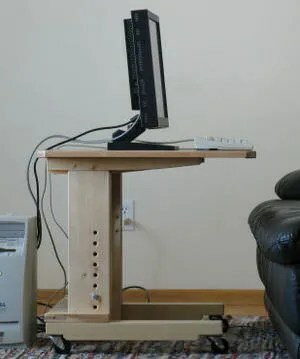 “Build a DIY Wide, Adjustable Height IKEA Standing Desk on the Cheap.” Lifehacker. 1/21/11. Adam Epstein. “IKEA Has Created a Desk That Converts From Sitting to Standing Via a Simple Button.” Quartz, 11/24/14. Adam Clark Estes. “IKEA Sit/Stand Desk Review: I Can’t Believe How Much I Like This.” Gizmodo. 10/30/14. Alan Henry. “Five Best Standing Desks.” Lifehacker. 2/23/14. Alex E. Weaver. “My Week with a Standing Desk.” BostInno. 9/26/14. Alice Robb. “Yet Another Reason Why We Should All Stand At Work.” New Republic. 6/30/14. Ashlee Vance. “Stand Stand: A Portable Standing Desk for the People.” Businessweek. 10/1/14. Ben Brooks. “Jarvis Standing Desk.” The Brooks Review. 2/27/14. Ben Schiller. “We Took Ikea’s New Automatic, Adjustable Standing Desk For A Spin.” Fast Company, Coexist. 11/3/14. Brett & Kate McKay. “Becoming a Stand-Up Guy: The History, Benefits, and Use of Standing Desks.” The Art of Manliness. 7/5/11. Chris Gardner. “How to Make a DIY Adjustable Drafting Table from Any Desktop.” Curbly. 1/18/11. Chris Murphy. “Standing Desks: What I’ve Learned.” InformationWeek. 6/20/14. Cia Bernales. “My Year at a Standing Desk and Why I’ll Never Go Back.” Fast Company. 4/11/14. Core Jr. “Standing Desk Shootout: Humanscale Float Table.” Core77. 8/24/11. Dan Kois. “Sitting Is Bad for You. So I Stopped. For a Whole Month.” New York Magazine. 6/9/14. Daniel Engber. “Who Made That Standing Desk?” New York Times. 3/20/14. Darrell Etherington. “Press Fit Standing Desk Review: An Affordable Option with U.S. Manufacturing and Materials.” TechCrunch. 9/1/14. Dominic Smith. “The Literature of the Standing Desk.” The Millions. 5/15/14. Drake Bennett. “Kill Your Desk Chair – and Start Standing.” BusinessWeek. 6/28/12. Elizabeth Narins. “6 Ridiculously Simple Standing Desk Hacks.” Cosmopolitan. 8/13/14. Emily Oster. “I Stand Corrected About the Best Kind of Desk.” FiveThirtyEight. 5/21/14. Gina Trapini. “Why and How I Switched to a Standing Desk.” Smarterware. 1/16/11. Gregory Ferenstein. “Work Like Churchill-Ditch Your Office Chair and Embrace the Standing Desk.” The Daily Beast. 6/2/14. Gwynn Guilford. “There’s a Huge Hidden Downside to Standing Desks That No One Told Me About.” Quartz. 9/29/14. Heather Moore. “How to Use a Standing Desk.” Philly. 4/22/14. Holly Korbey. “How Standing Desks Can Help Students Focus in the Classroom.” KQED (Mind/Shift). 10/21/14. Jared Alexrod. “7 Standing Desks That Won’t Break the Bank.” Paste Magazine. 10/17/14. Jennifer Gosse. “Why An Adjustable Height Desk is Our #1 Health-Related Workhack for 2014.” Tracky. 1/15/14. Jessica Stillman. “What’s Healthier Than a Standing Desk?” Inc. 9/16/14. Jim Carlton. “Standing Desks Are on the Rise.” WSJ. 8/31/11. John Biggs. “Gift Guide: The UpDesk Standing Desk Video Review.” TechCrunch. 11/13/12. Joseph Stromberg. “Five Health Benefits of Standing Desks.” Smithsonian Magazine. 3/26/14. Josh Smith. “Standing Desk Guide: Measurements, Examples, and Benefits.” Notebooks.com. 5/3/11. Julie Carlson. “5 Favorites: Longevity-Promoting Standing Desks.” Remodelista. 5/15/14. Karyne Levy. “I Tried Out a Standing Desk For All of the Benefits – Here’s Why I Quit.” 6/22/14. Kate Taylor. “Get Up, Stand Up, For Your Life: Can Standing Desks Fight Sitting Disease?” Forbes. 8/2/12. Kathleen Pierce. “Many Employees Abandon Sitting While Working.” Boston Globe. 3/26/12. Kerry Butters. “A Standing Desk Might Not (Necessarily) Save Your Life.” sitepoint. 10/20/14. Kerry Flynn. “How to Make a Standing Desk for Under $200: MIT Grads Go Digital.” Forbes. 7/31/14. Kevin Michaluk. “Standing Desks – Why I Use One; Why You Should Too.” Crackberry. 2/28/12. Kristin Hohenadel. “A Mobile Standing Desk for Laptop Users on a Budget.” Slate (The Eye). 10/2/14. Lecia Bushak. “Standing Desks, Friend or Foe? What Happened When I Stood At Work For the Last 4 Months.” Medical Daily. 9/18/14. Lloyd Alter. “Are Standing Desks Healthier Than Sitting?” Treehugger. 2/25/10. M Neuhaus, GN Healy, DW Dunstan, N Owen, EG Eakin. “Workplace Sitting and Height-Adjustable Workstations: A Randomized Controlled Trial.” American Journal of Preventative Medicine, January 2014, 46(1), pp. 30-40. Matt Linderman. “Bootstrapped, Profitable, & Proud: GeekDesk.” 37Signals. 6/15/11. Mikael Cho. “Why I Killed My Standing Desk.” Crew. Michael Desmond. “Five Questions with GeekDesk Founder Donovan McNutt on Standing Desks.” About.com. North Krimsly. “The Latest Height Stand-Up Desks.” High Integrity Design. 12/2/13. Peter Koch. “Stand-Up Guy: 5 Best Standing Desks.” Gear Patrol. 7/11/14. Phaedra Riley. “Standing Desk Shootout: Haworth Planes Height-Adjustable Table.” Core77. 8/16/11. Rain Noe. “‘Living With’ Product Review: The GeekDesk Truly Transforms the Way You Work.” Core77. 6/21/11. Ray Hu. “Standing Desk Shootout: Steelcase Airtouch Height-Adjustable Table.” Core77. 8/30/11. Simona Ganea. “10 IKEA Standing Desk Hacks With Ergonomic Appeal.” homedit. 8/5/14. Stephanie M. Lee. “Companies Take a Stand Against Sitting.” SFGate. 8/8/12. Stephen Searer. “7 Height-Adjustable Desks That Won’t Murder You.” Office Snapshots. 8/24/12. Steven Salzberg. “Does a Standing Desk Lengthen Your Lifespan?” Field of Science (Genomics). 9/28/14. Thorin Klosowski. “How Sitting All Day is Damaging Your Body and How You Can Counteract It.” Lifehacker. 1/26/12. Todd Wasserman. “Are You Sitting Down? Why a Stand-Up Desk Might Save Your Life.” Mashable. 4/22/11. Vicky Hallett. “Standing Desks Sit Well With More Employees.” The Washington Post. 5/20/14. Dave, great article and lots of good research. Wish I had your article to read when I was trying to make a decision on which standup desk to buy. Having said that, I’m very happy with the GeekDesk I bought! North – Thanks for the feedback! I’m glad you have found the GeekDesk so satisfactory! (https://myupdesk.com/deals) are having holiday sales now. Did you purchase a height adjustable desk? I’m also thinking about purchasing either MultiTable ModTable Manual or UpDesk CrankUp Small. I actually just purchased a MultiTable ModTable Manual today. Their website’s shopping cart wasn’t working correctly, so I had to call to make the order. Awesome article. Best I found anywhere. Moving forward with the Multi-table “L” shaped electric desk, as they use a Bosch motor for the legs, which is the only company I could find using a reputable company for the motors. Should the motor ever fail after the warranty, only $150 + shipping to fix. Thanks for the compliment Tom! I actually ended up going with a Multi-Table as well (crank), I’ve been meaning to write a review sometime soon for the site. I have been doing some research into which one to get and came across your article. Great article! I have narrowed it down to a couple and ModTable is is at the top of my list. After having used it for a while, do you wish you had gotten the electric one instead. I spoke to one of their reps and she mentioned that the one other advantage of the electric one is that it is rated for higher load. Though, I think that that is not a big issue for me. I suspect the entire weight of the setup (including the top) would be about 60-70 lbs. I’ve actually just purchased my second ModTable. My first was for the home office, this second one is for the work office. I started with the hand crank and stayed with it this time around. I still think it is the best choice!